Providing you the best range of ravishing kanchipuram silk sarees, heavy designers embroidered net sarees, hand embroidered sarees, embroidery beauty designer sarees, wedding embroidery party wear saree and party wear indian designer embroidered saree with effective & timely delivery. We are one of the leading manufacturers, supplier and exporter of Ravishing Red Embroidered Sarees. These are beautiful designer sarees offered by us. These are in demand mostly by newly married girls. We offer a wide range of designer sarees. Available in different types such as designer, printed, and floral, these sarees are made from superior quality fabrics to meet the taste of domestic as well as indian markets. Our range of sarees is available at most affordable price. We specialize in offering an enthralling collection of Heavy Designers Embroidered Net Sarees. Get ready to rock your parties with this beautiful creation. Our company offers a supreme quality range of latest designer sarees and we also make designs as per client need and order. We are amongst the prominent names of the industry that are engaged in manufacturing, supplying & exporting a wide range of Exclusive Hand Embroidered Sarees. These products are available in different elegant designs and patterns. We manufacture a wide range of party wear Embroidery Beauty Designer Sarees that is available in spectrum of colors for our customers spread across the globe. These Party wear Sarees are comfortable to wear and are real eye catchers. Apart from exclusive designs, the dazzling colors of these sarees are highly appraised by our customers. Wedding Embroidery Party Wear Saree Indian Chiffon Printed Beautiful Saree Sari With Outstanding Color Combination. We have captured the market by offering our customers with captivating Party Wear Sarees, which are ideal for parties and made from excellent quality fabric sourced from a reliable vendor base. We have a wide collection of highly pleasing and appealing Designer sarees that are extremely fashionable and are suitable for casual or formal occasion. These sarees are widely appreciated for their intricate designs, superfine fabrics and color fastness. Our customers can avail these sarees in different colors, prints and patterns. We offer a comprehensive collection of Embroidered Border Design Sarees to our valuable clients. 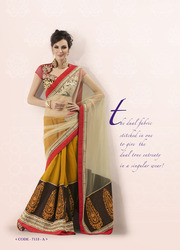 In order to render glamorous appeal, these sarees are intricately made. Well-reckoned for their attractive designs and eye-catching patterns, these sarees are highly coveted by our esteemed clients. Avail from us a stylish range of Designer Embroidery Party Wear Sarees, which are creatively crafted by one of the expert hands of industry. Made from finest quality silk and other fabrics, these designer sarees are very comfortable to wear and are very appealing in look. We are one of the leading organization engaged in offering a wide variety of Indian Designer Sarees, which are appreciated by our customers for their colour fastness, high shrink resistance and appealing designs. Our prestigious clients can avail from us an outstanding assortment of party wear Designer Sari Embroidery Net Party Wear Sarees at industry leading prices. These sarees are designed with exclusive embroidery and contrasting patch work. The sarees offered by us are very graceful and are a perfect attire to be worn at parties & occasions. Owing to our rich industrial experience, we are offering Embroidered Fashion Designer Sarees to the customers. These sarees are made using finest quality of fabric and other material & accessories to make them of flawless quality. Moreover, we check these products on various parameters to ensure that these are defect-free. We offer our clients a wide range of ladies Beautiful Embroidered Work Sarees that is available in numerous styles and designs. This soft hue saree has colorful motifs and bold borders can bring out the feminine charm of the lady wearing it. Clients can avail these beautifully designed sarees at industry leading prices from us. Looking for “Embroidered Silk Sarees”?